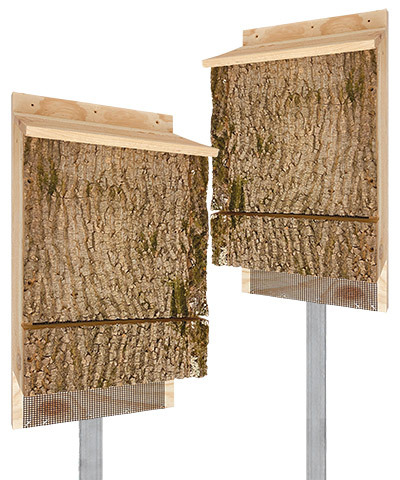 Offer a different pollinating animal roosting spots in your yard by adding these Triple Chamber Bark Clad Bat Houses with Poles to it. Providing homes to bats not only helps these beneficial animals thrive; it also offers natural pest control, as they consume insects. These two, Uncle Dunkel’s Triple Chamber Bark Clad Bat Houses each have three, 0.7" deep compartments, accommodating up to 300 bats with ease. Polyethylene netting throughout the interior of each creates plenty of gripping spots for the bats, and they can enter via the bottom opening and generous landing pad. A bark overlay brings a natural hint to each home, and a 0.25" wide, horizontal gap on the front of each provides ventilation. Use the included, plastic adapters to attach the pieces to the S&K Telescoping Bat House Poles, for installation in your yard in moments. These hardy, triangular aluminum poles place the shelters at a fantastic height for bats, and their included ground sockets keep the units stable. Help bat populations find suitable housing with these Triple Chamber Bark Clad Bat Houses with Poles. Bat houses made in the USA.